Blue light glasses are one of the more recent things to make their impact on the gaming and computer world. As people become more and more reliant on technology for both work and pleasure, our eyes need to gradually adapt to being able to use screens at an increasing rate. A good way to prevent some of the issues that can come of overuse of screens can be by investing in a good quality pair of computer glasses. This can undoubtedly help prevent an abundance of different issues, particularly eye strain and insomnia. There’s little risk in trying a set of blue light glasses and seeing if they work for you – they’re relatively expensive, and as they become more popular, brands are releasing better and better models. 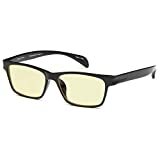 Whether you work 10 hours a day in an office or you spend your entire evenings blasting zombies, here are some of the better computer and gaming glasses that you’re going to find online. For me, these Gamma Ray Optics are undoubtedly the best option for anyone looking for a new set of blue light glasses. They’re ideal for anyone who is on the fence about buying a set and isn’t entirely sure whether they’re really going to end up using these glasses all the time. Why? Well, because they’re ridiculously cheap, that’s why! When you compare them to better known brands like Gunnar, or even mid range computer glasses like Duco, then they’re still considerably cheaper than their competitors. What’s more is that there really isn’t a great deal of difference between the Gammy Ray glasses and other, far more expensive brands available. The reality is that they same materials and methods are used in the majority of glasses lenses, and you really end up paying for the frames themselves and the brand. The good news is that even though Gamma Ray Optics are one of the cheaper brands available, this doesn’t necessarily mean that their customer support is non existent. In fact, they have some of the best customer support for these types of glasses, and if you contact them with an issue they’re sure to try and help you resolve it. The only real negative with these glasses is that or some people with larger heads (like me), they can fit a little snug. That means that if you’re looking for something a little looser, you might want to look elsewhere and find a set of glasses with a wider fit. Gunnar are the best known name making both computer and gaming glasses. In recent years, they’ve even expanded and they now have a wide variety of both sunglasses and even prescription glasses, too. Though I don’t generally think that Gunnars are worth the extra price, there are some good things about them. For the most part, they’re usually a little more endurable than the cheaper sets of computer glasses that you find online. This means that you won’t need to buy a new set every year, as they should last you a long while. And if your Gunnar glasses do break, then they do have a good warranty. This means that if you do have any issues with your glasses, their customer support is pretty helpful and should resolve any issues that you might have. Generally, unless you want to go for the higher end of computer glasses, then you don’t necessarily need a set of Gunnar glasses. But if you’re looking for a step up on your current set of computer glasses, then opting for a set of Gunnars can be a good idea. Flexible and lightweight TR90 frame material allows for extended use as reading glasses in front of all electronic devices . 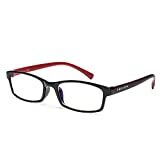 Rx-able Rx Prescription Ready High Quality Eyeglasses Frame. When you talk about Gunnar glasses, Duco are often not far behind. They’re also one of the better known names within the computer glasses sector, though their products often run at a fraction of the price compared to Gunnars. Duco are the Adidas to Gunnars Nike, if you will. That doesn’t mean you should overlook the Duco glasses completely. They’re still a decent set of glasses that shouldn’t be disregarded, as for the most part, they’re equals to the Gunnars in terms of effectiveness. The offer a more lightweight frame compared to other computer glasses around, and they’re ideal for using whilst gaming too. They come in nice packaging, so they’re also worth considering if you’re looking to give these glasses as a gift. The main issue that people generally have with the Duco glasses is that they look particularly nerdy. For some people, that won’t be an issue (if you’ve grown up wearing glasses, you’re probably used to it!). However for others, this will be a major factor and you might want to opt for something more fashion conscious. If you’re looking for a more typical set of nerdy computer glasses, then you might want to check out this set from Prospek. One of the best things about going for a set of bulky glasses like these is that often, they end up being far more resilient than other, more fragile glasses. If you don’t mind the appearance of these glasses – they’re pretty nerdy – then this likely will be an advantange of you. Prospek glasses look more like your typical set of glasses, whereas Gunnar and Duco produce more yellow tinted glasses, which some people aren’t a fan of. The idea of these glasses is that they allow 50% of the blue light through. 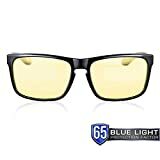 With all computer glasses, some blue light is going to pass through, but we want to try and minimize some of this so it doesn’t have a negative effect on your eyes. 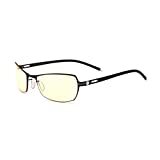 If durability and a regular appearance is essential for you, then you can consider this set of computer glasses. ANTI BLUE LIGHT & UV - our patented amber tinted lens block 60% blue light in overall with perfect balance of filtering 85% very harmful blue light in the 400~440nm wavelength and allowing transmittance of 56% less harmful or even beneficial blue light in the 440~500nm wavelength. 100% block UV400. NO MORE EYE STRAINS & GLARES - anti reflective (AR) coating and tinted lens eliminate glare, improve contrast, and enhance depth perception, reducing digital eye strains, eye fatigue, and headache, optimizing visual acuity clarity with fewer distractions and more viewing comfort, and helping fall asleep faster. Ideal for working, gaming, or browsing on PC, tablets, smart phones, TV or near office LED lights. PREMIUM Ultra-high elastic amber nylon lenses infused with ultra-anti-UV transparent crystal material would not cause scattering of visible lights. Excellent resistance to stress, cracking and chemical makes it the first choice of material for high-end lenses, doubling the cost of ordinary lenses. Lenses have passed FDA Drop Ball Test to ensure impact resistance and safety. FDA REGISTERED manufacturer and distributor guarantee your satisfaction on the product quality. The GameKing Ultra glasses provide another option for a decent set of computer glasses in a slightly different design. If you prefer the sunglasses style, then these may prove to be a good option for you. They don’t come available with any sort of magnification, so these are strictly computer and gaming glasses – they won’t be suitable if you’re looking for something to replace your regular glasses while you work. They’re listed as a premium set of glasses, and they certainly feel like that when they arrive – you can tell from the packaging that they’re going to be of a decent enough quality. Overall, there isn’t a dramatic amount of difference between this set and other sets available. But, they do prove to be a lightweight and stylish option that’s slightly different from the ones listed. Generally, there are a few main reasons why you might want to consider using blue light glasses. Whilst not everyone loves them, if you deal with any of these issues, it can be worth giving them a go. If you’re a gamer like me, then you likely get home from work or school and sometimes, you can play games until it’s time to sleep. But when it comes to sleep, you have trouble actually sleeping. Sound familiar? Well, this was the case for me for a long time. I’d get in to bed restless and not be able to fully sleep for at least an hour, likely because my brain was still active. Not only this, but research shows that blue light can keep you awake. After investing in a cheap set of blue light glasses to protect my eyes, I find sleeping much easier than I have in the past. As well as this, I’ve also change some of my other habits to ensure that gaming doesn’t ruin my sleep pattern. In a world that’s increasingly reliant on technology and screens, eye strain can be one of the most annoying things to deal with. If you work in an office and spend much of your day on a computer, then the chances are at some point, you’re going to end up dealing with digital eye strain. Eye strain can occur when you spend too much time looking at a bright screen. As well as investing in a good pair of computer glasses, it’s essential that you take regular breaks from computer work. Even as short as 30 seconds can make a difference – spend this time focussing on something far in the distance, and this can help reduce your risk of eye strain. There’s a lot of research that suggests that those that spend a lot of time working in offices looking at screens often deal with dry eye syndrome. This is a syndrome where eventually, your eyes do not produce enough moisture for your eyes, which can end up making them red and irritated. Although the research is thin at the moment, there is some that suggests that computer glasses can be helpful, although there are other things that you can do to manage this as well. If you deal with dry eyes, then eye drops and blinking exercises are just some of the things that can help. 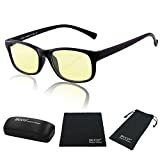 Overall, a set of computer/gaming glasses can make a massive difference to your entire day. Even if it’s just a cheap pair, it can be a good idea to try them out and see if they make a difference for you. Eve though the difference may not appear to be massive, they can help in a variety of different way. Clearly, you really don’t need to spend a fortune on computer glasses to get yourself a set – you can pick up a cheap set online for $15. But if you’re working with screens all day, then coming home and spending time gaming on your phone, then it only makes sense to try and hinder the effect these lights may have on your eyes.